Pressure Transducer Delivers water level monitoring in emergency tank shower! Applied Measurements were recently contacted by spill control and containment manufacturer Empteezy, to provide a sensor to be used within an emergency tank shower. The emergency tank shower is ideal for use in locations where a constant water supply and adequate water pressure cannot be guaranteed. To ensure the emergency tank shower is able to provide a flow of 75.7ltrs per minute of water for 15 minutes, fulfilling the ANSI Z358.1 regulations for emergency tank showers. Once a gravity fed shower is switched on and the water level within the tank drops, both the water pressure and the flow rate at the shower head decreases. In order to achieve the flow rate of 75.7ltrs per minute of water for the full 15 minutes, the emergency tank shower needs to contain a minimum of 2000ltrs of water within the tank. Applied Measurements provided Empteezy with a Pi600 series pressure transducer. The pressure transducer was connected and calibrated to the digital readout scale on the front of the shower, giving an accurate reading of the litres of water remaining in the tank. When the water level falls below the minimum safety level, a signal is sent to the sounder strobe alarm on the front of the shower. This signal has a dual function. Firstly, alerting safety personnel that the water level has dropped below the minimum, notifying them to refill the shower to achieve the required flow rate and water pressure. Secondly, that the shower has been operated and an injured employee may need assistance. The Pi600 series of pressure sensors are designed for the measurement of gas and liquid pressure across a wide range of general purpose and industrial applications such as hydraulics, medical, research and development, meteorology and food processing. Constructed from stainless steel with a ceramic diaphragm and viton ‘O’ ring seal as standard, they are designed to be extremely rugged, yet compact in design. 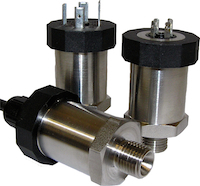 These pressure transducers come in pressure ranges of 0-50mbar and 0-700bar in absolute or gauge versions, with a wide choice of electrical output signals from its ASIC-based amplifier circuit. These outputs include, 4-20mA, 0-5Vdc & 0-10Vdc, 1-6Vdc and 10mV/V, as well as a ratiometric 0.5-4.5Vdc signal that requires a 5Vdc supply to suit most data loggers. The Pi600 series of pressure transducers can also be supplied with any of our wide range of instrumentation to give you a complete calibrated system. In addition, the series can be completely customised to suit your application including; custom process connections, alternate case and ‘O’ ring material for applications where aggressive media is present, and higher IP ratings for more challenging environments. The Pi600 series of pressure transducers have proved vital in Empteezy’s emergency tank shower units, enabling engineers to guarantee the water pressure and flow rate of the units. We are always looking for new and exciting challenges so contact our technical sales team today on +44 (0) 118 981 7339 or info@appmeas.co.uk to discuss your application. Pressure transmitter shipments, after returning to pre-recession levels in 2010, saw strong growth in 2011, even besting 2010’s growth by several percentage points. Despite the return to positive growth, risks remain, such as continued economic uncertainty in the US and Europe, and slowing growth in Asia. “Although the economy is sending mixed signals, the pressure transmitter market will likely continue to see positive growth. Ongoing demand for energy will require more oil and gas, driving up demand and long-term energy prices. Finding new oil deposits is becoming more difficult and those that are found tend to be more challenging to develop and refine, creating significant opportunities for pressure transmitter suppliers,” according to Senior Analyst Allen Avery, the principal author of ARC’s “Pressure Transmitter Worldwide Outlook” . Key highlights for the pressure transmitter market in 2011 included growth in both established and emerging economies, especially for energy and infrastructure related applications. After a down year in 2009, the majority of suppliers enjoyed a rebound in sales during 2010, and this trend continued in 2011. Sales of smart pressure transmitters will continue to outpace those of conventional and low-cost devices, as users seek to utilize recent technological advances to improve visibility into plant operations to help maximize productivity and the availability of production resources. This user focus on asset management also fuels demand for transmitters that incorporate onboard diagnostics capabilities and use digital communication protocols. Increasingly tough safety and environmental regulations have helped drive increasing adoption of safety integrity level (SIL)-rated transmitters for safety instrumented systems (SIS) to mitigate the risk of such catastrophic events. Pressure transmitters are an integral part of safety instrumented systems, and most leading pressure transmitter suppliers now offer SIL-rated transmitters. 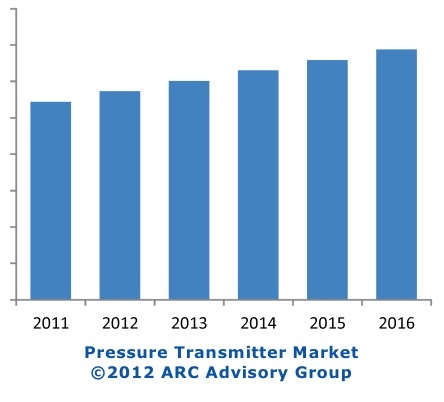 ARC expects the developing countries such as the Middle East, China, Russia, and India to drive the majority of the global growth in pressure transmitter shipments going forward. EPC backlogs have returned to near all-time highs as they once again struggle to keep pace with increasing demand. Despite the country’s slower GDP growth in recent quarters, the electric power industry in China continues its investments, creating opportunities for pressure transmitter suppliers. The ongoing need to replace the aging fleet of nuclear power plants in Russia drives pressure transmitter investments. In India, the need for both increased generating capacity and a more stable power infrastructure to reduce brownouts drives the need for more pressure transmitters. Yokogawa has developed three new field wireless system devices and has enhanced existing wireless pressure and temperature transmitters, all of which are compliant with the ISA100.11a wireless standard. The first of these products are scheduled to be released in March 2012. These new wireless products can be used to construct highly reliable large-scale plant networks, and may also be incorporated in small- and medium-sized networks that already utilise Yokogawa’s existing products, substantially expanding their capability. This is in line with the company’s “Grow” concept of enabling customers to expand their plant wireless networks while making full use of existing assets. ISA100.11a is a wireless communication standard for the industrial automation field that was established in September 2009 by the ISA100 Committee of the International Society of Automation (ISA). This was approved as a National Standard by the American National Standards Institute (ANSI) in December 2011, and has been submitted to the IECSC65C Subcommittee for approval as an international standard. 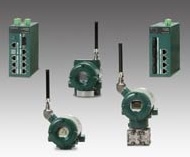 A wireless network that connects a control system with field devices such as differential pressure/pressure transmitters and temperature transmitters has many advantages: it reduces cabling and other installation costs, and allows the installation of equipment in difficult-to-wire locations. In July 2010, Yokogawa began offering entry-level field wireless system solutions based on the YFGW710 field wireless integrated gateway. Users of these systems have come to value their high reliability, real-time performance, and environmental resistance, which help to ensure stable plant operations, as well as their immunity to electromagnetic interference and secure wireless communications. A number of these users now wish to expand their wireless networks. To meet this demand for large and reliable plant wireless networks, Yokogawa has developed three new field wireless system devices and enhanced two existing field wireless transmitters. The new products are a field wireless management station, a field wireless access point, and a field wireless media converter. The field wireless management station is a new gateway device for connecting production control systems and field wireless devices, and includes system and security management functions. The field wireless access point is a new router device for connecting field wireless devices and gateways, while the field wireless media converter is a new device that converts data from the 100BASE-TX to the 100BASE-FX format. The enhanced devices are the EJX-B series differential pressure/pressure transmitters, the YTMX580 wireless temperature multiplexer, and the YTA 510 temperature transmitter, both of which now have detachable remote antennas and feature low power consumption design. Each of the new field wireless system devices offers dual redundancy via a backup device. If the communications link is broken or a hardware failure occurs in any of these devices, automatic switchover to the backup device is implemented and the communications link is restored, ensuring uninterrupted communications with field wireless devices and increased reliability in process monitoring. This feature also offers the same benefits in any future application of wireless communications technology for process control. Compared to the YFGW710, the new field wireless management station can manage up to ten times the number of field wireless devices. Both it and the new field wireless access point support communications with 100BASE-TX, 100BASE-FX, and wireless LAN networks, allowing for both the expansion of plant wireless networks and the full use of existing assets. Both the EJX-B and YTA510 transmitters now come with an antenna that can be removed and mounted in a separate location, extending the communications range. A high-gain antenna option is also available that can extend the communications range up to four times. The high-gain antenna, also called a “long distance antenna”, emits strong radio waves, allowing wireless communications over a wider range. In addition, through the incorporation of low power consumption design features, battery life is now twice as long. Major target markets are process manufacturing industries including oil and gas (onshore/offshore facilities), petrochemicals, chemicals, iron and steel, pulp and paper, power, and water treatment. Typical applications are the measurement of temperature, pressure, flow, and tank fluid level. Yokogawa presents wireless communications and other field digital technology solutions that help companies to optimise their plant operations. Support of the ISA100.11a standard ensures high reliability, application flexibility, network expandability, and compatibility with a variety of wired communication standards. In July 2010, Yokogawa released the world’s first ISA100.11a compliant field wireless devices. As the industry’s support of the ISA100.11a standard gains momentum, the number of ISA100.11a products is expected to increase. Yokogawa will continue to enhance interoperability for seamless connection with other companies’ products and will develop sophisticated wireless control solutions for continuous processes. The company’s focus is on proposing field wireless communications solutions based on the “Grow” concept. By making possible the expansion of wireless systems, educating users about wireless solutions, and improving convenience, Yokogawa aims to help its customers to grow their plant operations. Driven by a stronger emphasis on plant asset management and safety applications, the worldwide market for Pressure Transmitters is expected to grow at above-average rates as capital investment programs continue to recover after the global recession according to a new ARC Advisory Group study. After dipping more than 10 percent in 2009 due to the effects of the global recession on the automation market, the pressure transmitter market saw a speedy and strong recovery in 2010, driven by increased business in the energy sector. Pressure transmitter suppliers have benefited from renewed investment and expansion activities, and they have aligned their business goals to capitalize on growing industry segments and geographic regions that will enable them to increase market share. “Oil prices are on the rise again with the economic recovery, increased demand, and political and social unrest in the Arab world. This should continue to drive demand for pressure transmitters going forward, as higher prices favor increased exploration, production, and processing of fossil fuels,” according to Analyst Allen Avery, the principal author of ARC’s “Pressure Transmitter Worldwide Market Outlook Study“. Pressure transmitters have evolved into highly capable and reliable process instruments, offering users better measurement accuracy, increased visibility into their production operations, and diagnostic tools to help detect problems with both plant equipment and processes. While the installed base of transmitters probably still works well, the question users should ask themselves is whether or not these devices, which may lack intelligence or the ability to take measurements within ever-tightening tolerances, are suitable for a business environment that demands more efficiency, reliability, and safety than ever before. A new emphasis on safety will drive adoption of Safety Instrumented Systems and SIL-rated transmitters, which carry a much higher price tag than conventional, non-rated models. Plant owner-operators have begun to take the reliability and longevity of their key assets very seriously, and can be expected to implement plant asset management systems and smart instrumentation. Sales of wireless transmitters have increased substantially in recent years, and we expect that adoption rates will continue to be healthy in the future, particularly once wireless standards coalesce. Regionally, suppliers can expect to see the largest growth in the Middle East due to its high concentration of oil and gas activities, and in Asia, where heavy investment in new plant construction continues in core sectors. In the mature North American and Western European markets, suppliers will largely rely on replacement business. Latin America will see above average growth, but remain a relatively small market for pressure transmitter suppliers. I had a chat with Lyndon Thomas of Bentley Instruent Company the other day. He tells me they have launched a new on-line shop which offers a wide range of instrumentation from leading manufacturers. Bentley Instrument Company was founded in 1964 to service and distribute a broad range of instrumentation throughout Ireland. Since 1995 Bentley has been a member of the British Rototherm Group. In 1995 Bentley achieved ISO 9002 quality assurance approval and has grown to be an important supplier of high quality products and calibration services throughout Ireland. The current issue of Read-out is the first of 2010, the last year of the first decade of the 21st century! Distributed free to nearly 2400 named automation professionals throughout Ireland and to some subscriptions abroad it is without doubt Ireland’s leading source of information on the industry. Ireland has had its share of buffeting in the current economic woes that the global economy is suffering. After almost 15 years of unprecedented growth Ireland, and its Celtic Tiger, hit the wall at the end of 2008 and great indeed was the fall. Irregular goings-on in the banking sector did nothing to soften the fall and the harsh measures needed to cope with the downturn included general reduction in salaries not to mention severe job losses. These mostly occurred in the construction industry and so have not, by and large effected the process industry though it did effect some manufacturing with some famous names falling by the wayside. 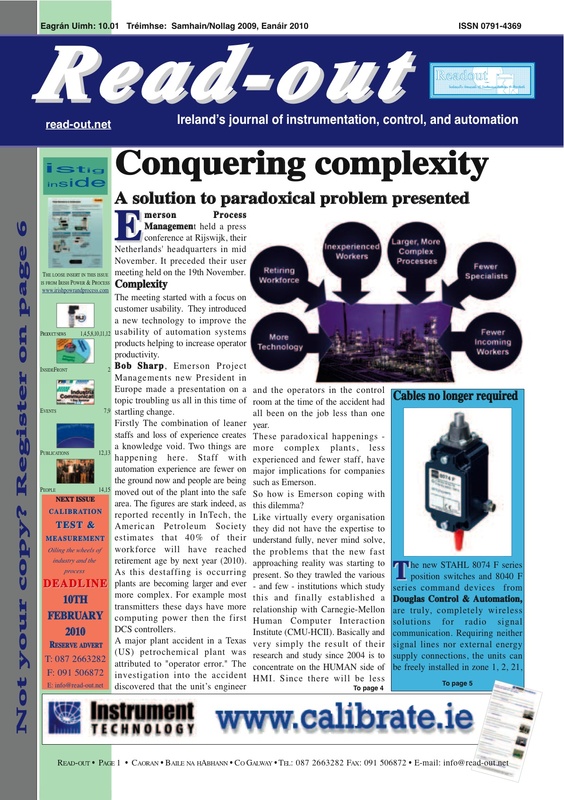 This issue of Read-out highlights Emerson Process Management’s solution to the paradoxical problem of more complex technology and the shortage of experienced personnel that Signpost readers learned of in our item Conquering Complexity. Also highlighted on the front page was the new series of wireless devices marketed by Douglas Control and Automation and manufactured by Stahl. There was however a certain emphasis on pressure measuring instruments in the products highlighted in that section of the publication. An article in the InsideFront series discusses a paper from the ARC Advisory Group on Fieldbus Foundation technology as a business value proposition. This paper was unveiled at the recent SPS/IPC/Drives Exhibition in Nueremberg (D). As might be expected there is an item on the changes in the International Society of Automation including the early build-up to the new Automation Week and the appointment of a new editor at their magazine InTech. In late November and early December, Ireland suffered unprecedented rainfall which lead to extensive flooding over large swathes of countryside. Read-out highlights how local supplier MeasureIT provided a round the clock service especially with the Tideflex check valves, 20 years in Ireland in 2009, which did in fact help in some areas which were prone to flood and which escaped this time. Usually there are some books recommended in each issue of Read-out and this issue is no exception. Included are George Buckbee’s book on “Mastering Split-Rang Control” and Professor Gerald Cockrell’s on Practical Project Management. In company news the big organisational changes in ABB are reported with details of the heads of the various divisions. This issue concludes as usual with People News, people and events which occurred in the past few months. The next issue of Read-out (Feb/March 2010) will be highlighting Calibration, Test & Measurement! The Nestlé research and development centre in Konolfingen, Switzerland, is developing milk-based constitutional food products. The pressure monitoring at the heat exchangers in the new testing facility is conducted by Baumer pressure transmitters, which are equipped with hygienic CombiConnect process connections made of stainless steel. In Konolfingen, the international nutrition company Nestlé operates the Nestlé Product Technology Centre (PTC) – one of 24 research centres worldwide. For more than 30 years, the company has been developing milk-based products and the respective production processes there, with the main focus lying on infant food, special diet nutrition and health care food. The Konolfingen developers are researching appropriate recipes and testing processes for all operational Nestlé companies worldwide requiring new products for these areas. For hygienic reasons, all measuring devices in their new testing facilities had to be equipped with an aseptic screw connection according to DIN 11864-1. All over the PTC, pressure transmitters of the ED701 series were already being used in various other applications such as homogenisers, mills and filling equipment. Since Nestlé had been very satisfied with those devices, they were also chosen for the pressure measurement at the new facility’s heat exchangers. Depending on the processes to be tested, up to six heat exchangers are used for heating and/or cooling the products, with the temperatures going up to 150°C. At high temperatures, the products precipitate protein, which then sediments at the heat exchanger’s metal plates. If there is too much sediment on the exchanging face, the differential pressure between the product and medium side rises and the heat exchangers have to be cleaned. With this application, the PTC developers test the recipes and manufacturing processes with different kinds of liquid products ranging from milk to dessert crème. Among other results, the tests show the possible range of process temperatures between medium and product as well as the time period the production can run without the heat exchanger needing to be cleaned. The differential pressure is measured by the ED701, a piezo-resistive pressure transmitter with a stainless steel diaphragm for industrial and hygienic applications. It is based on a silicon sensor designed for high precision within the widest possible range of temperature. Its downstream digital compensation reduces the signal drift. The piezo-resistive silicon sensor is anodically bonded to a very stable glass base attached to a stainless steel construction, which guarantees an excellent thermal isolation. A stainless steel diaphragm and a specially processed filling liquid isolate the sensor from the process medium. The electronics are located within the hermetically sealed transmitter housing, making the ED 701 extremely resistant to humidity, shock and vibration. Depending on the choice of the electrical connection, the protection classes vary from IP 65 to IP 67. The electronics’ core piece is a micro-controller compensating any drift effects on the sensor signal due to temperature changes. Therefore, these effects can be eliminated over a wide range of temperatures with a short response time. The ED 701 is available with a great variety of pressure and electrical connections, a 4…20 mA current loop and various voltage output signals. The line’s most distinctive features are its short response time (max. 5 ms) and an excellent repeatability and long-term stability. The hygienic design makes the ED 701 series most suitable for applications in the food and beverage processing industry as well as in the pharmaceutical and biotechnology industry. Any parts contacting the media are made of stainless steel 316L / 1.4435 and all materials, including the white oil used as standard filling liquid, are compliant with the FDA standards. For the use in the heat exchangers, the pressure transmitters were constructed with an accuracy of 0.4% FS and a compensated temperature range of -10 to 125°C (on the cooling water side) respectively a high medium temperature of 300°C maximum (on the heating side). The measuring range of the gauge pressure covers 0 to 20 bar. 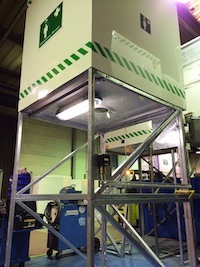 Since a new process connection was also required for the new milk tube, the Nestlé PTC developed a special adapter for the ED701 in co-operation with Baumer. Whereas Baumer delivered the connection for the pressure-receiving side, the matching part on the product side was constructed by Nestlé. “For the milk tube fitting, Baumer offered us the CombiConnect adapter, which we found most suitable thanks to its flush-mounted O-ring”, says Ernst Strahm, measurement technologist at the Nestlé PTC in Konolfingen. The CombiConnect system provides a series of hygienic, replaceable process connections made of acid-proof stainless steel. Since they can be used with the pressure transmitters FlexBar and ED701 as well as the temperature measuring device CombiTemp, they offer a high flexibility. The connections were developed according to the demands of the food industry fulfilling the FDA and EHEDG criteria. A further challenge this application posed was the very small pipe with a diameter of only 10mm, making it very difficult to clean. The problem was solved by choosing a high flow rate and a pressure transmitter with a small volume compared to that of the tube. The Nestlé product developers had already been convinced by the reliability of the pressure transmitters used in various other applications. Concerning the heat exchanger applications in the new testing facilities, all upcoming challenges were mastered thanks to the flexible CombiConnect connections and a close collaboration with the manufacturer in developing an adapter. “For a hygienic pressure measurement, the quality of the measuring devices is the decisive criterion. With the ED701, we have had consistently good experiences”, resumes Strahm.